Well done to all 11 students who attended the British Championships this weekend. Gabriel Ion became British Champion winning Gold in green belt boys heavyweight sparring. He won the final 10-0 overwhelming his opponent with a barrage of kicks. Other medal winners were Christine: Silver in Ladies black belt lightweight. Annabel: Silver in girls yellow belt lightweight sparring. 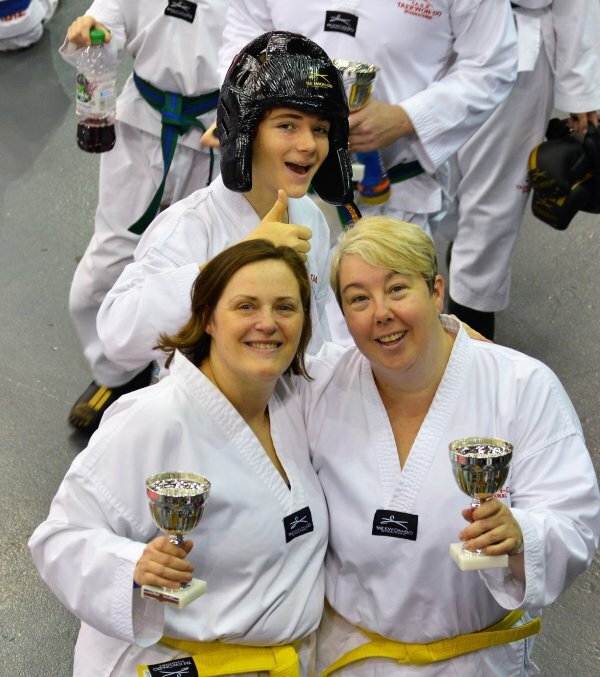 Tom: Bronze in boys yellow belt middleweight.Elaine and Sarah also picked up Bronze in executive ladies yellow belt sparring. In the team events Elaine and Sarah picked up silver in team patterns and in team sparring Tom and Liam also won Silver. Special mention to Felix Sarah and Elaine, all competing for the very first time. Felix just 8 years old tested himself out in boys green belt patterns and did the club proud performing pattern Do San. Elaine and Sarah should feel very proud in coming home with 2 medals each. Annabel also just missed out on a 2nd medal playing off 4 times in her patterns division and just missing out on Bronze. Julie and Jo did officials duties on the day.